Even though fall does not officially arrive until 4:44 this evening, I have already started to enjoy warm soup on cool evenings. This past Wednesday, the air was cool, the gentle breeze was blowing across the creek as it meandered through the back yard, and it was the perfect time for some comfort food. I knew people would think I was crazy for already eating soup and grilled cheese, but I didn't care. It was time! And oh, am I so glad that I did. The great thing about this version is that you can cook it in a little over a hour and enjoy it or you can allow it to simmer for a few hours, covered, and deepen the flavors even more. The leftovers are great. They definitely do not taste like a reheated meal. So put this recipe in your files and be ready to enjoy it on a cool fall or winter evening. 1. Heat a large Dutch oven over medium high heat. Brown the ground beef and onions, using a spatula to break the meat into small pieces as it cooks. Season with salt, pepper, and parsley. 2. Add the remaining ingredients to the pot. Stir well to combine. 3. Bring to a boil. Cover and reduce heat to medium. 4. Allow to simmer for at least 1 hour. 5. Add more salt and pepper to taste. As the nights begin to get a little cooler and the mornings are filled with fog, here in the South, we begin to welcome Fall. Flowerbeds begin to fill with colorful mums and the anticipation of fall foliage makes me almost giddy. The stands become filled with football fans, tailgating in the parking lots and enjoying the cooler weather. However, one of the biggest signs of the approaching Fall is the sudden jubilation over anything and everything pumpkin. Every year, I take the time to puree and freeze some fresh pumpkin to have for pies and other goodies throughout the year. I like to know that pure pumpkin puree really is pure pumpkin. With this year's Fall approaching, I am down to my last container of pumpkin from last year's harvest. While this is a little disheartening, it also means that a new harvest is on its way! This morning I woke up, inspired to make a warm, tender muffin filled with the flavor of Fall. My house was filled with the aroma of cinnamon, nutmeg and pumpkin. You would have thought that there was a pie in the oven waiting for Thanksgiving dinner. However, the best part was the muffin. They were crisp on the outside and moist on the inside yet still light enough to not feel so heavy for a busy weekend breakfast. So to the approaching Fall, I say welcome! 1. In a large bowl, sift together the dry ingredients. Set aside. Combine the wet ingredients in a measuring cup. Set aside. 2. In another large bowl, whisk together the sugars and pumpkin until smooth. Add one egg at a time, whisking to thoroughly combine. 3. Add the dry and wet ingredients, alternating, to the pumpkin mixture, beginning and ending with the dry ingredients. Whisk between each addition until smooth. You should add the dry ingredients in three batches. 4. Spray a large muffin tin with non-stick spray. 5. Carefully pour the batter into the prepared tins, filling each 3/4 of the way. 6. Bake in a preheat 350 degree oven for 25 minute, until baked throughout and golden. 7. Remove from the tins and enjoy! Who doesn't love meatballs? You can make them with ground pork, chicken, turkey, beef, or even veal. The right recipe will allow for a tender, moist dish. Thrifty cooks know that a meatball recipe allows for a small amount of ground meat to be spread out to feed a crowd. I am not sure why, but it is true. Meatballs can transform a meager pound of meat into a meal for 4-6 people, easy! I have several meatball recipes on my site. Some are for spaghetti, others for sandwiches, while others are for entertaining and football parties. These particular meatballs are great for sandwiches, as a main course, or even for cocktail parties. While rather untraditional, as far as meatballs go, these spicy, barbecued meatballs are delicious and a wonderful departure from the ordinary. 1. Combine sauce ingredients in a small bowl. Set aside. 2. Using your hands, combine the meatball ingredients in a large bowl. Mix until combined but not overworked. 3. Form the meatballs by pinching off a small amount of the mixture and roll in the palm of your hands. You want the meatballs to be the size of a golf ball. 4. Heat the oil in a large skillet. You want enough oil in the pan to come up about 1/2-inch. The oil should be hot enough to sear but not so hot that it smokes. 5. Roll the formed meatballs in the cornstarch, shaking to remove excess. Place in the heated oil and cook for 2 minutes, turn and cook for an additional 2 minutes. Remove from the pan and repeat with the remaining balls. 5. Place the meatballs in a large baking dish with high sides. Pour the sauce over the top of the balls. 6. Tightly cover with aluminum foil. 7. Place in a preheated 350 degree oven for 1 hour. 8. Remove from the oven and enjoy! Saturday morning breakfasts call for a warm, hearty meal. I love to slow down a little and make a delicious baked good for a weekend treat. While I have tons of muffin recipes I use, I decided to, once again, branch out and create something new. 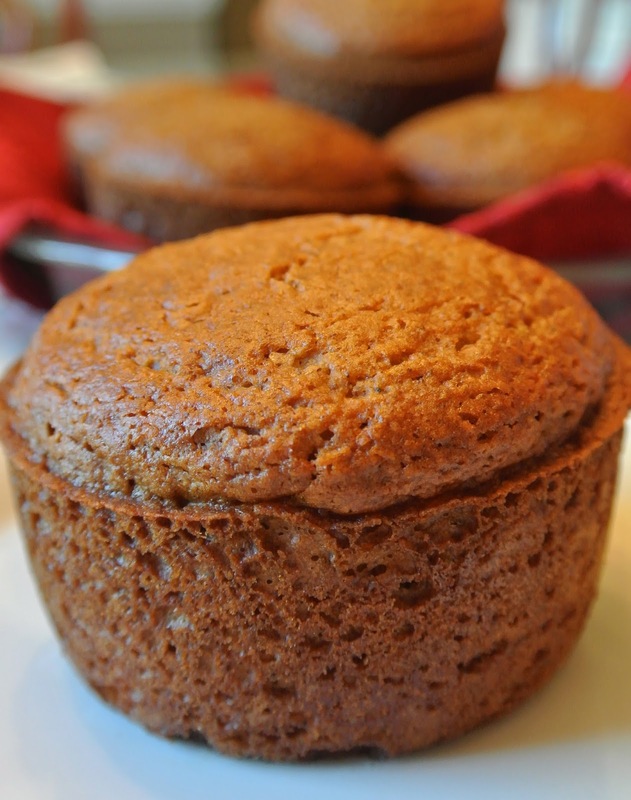 These muffins are dense, tender, slightly sweet and refreshing. The combination of fresh berries with the hint of orange is perfection. Happy weekend! 1. In a large bowl, combine flour, baking powder, salt and dried orange peel. Stir to combine. Set aside. 2. In the bowl of a mixer fitted with the paddle attachment, cream the butter and sugar. Add the eggs, on at a time, and whip until fluffy. 3. Combine the milk, orange juice and vanilla. 4. Alternate adding the dry ingredients and milk mixture to the butter. With the mixer on low, begin with the flour and end with the flour mixture, stirring well between each addition. 5. Sprinkle the blueberries with 1 Tablespoon of flour. Toss to coat. Sprinkle the blueberries into the batter. Use a large spoon to combine. 6. Spray the muffin tin with non-stick spray. Spoon the batter into the prepared pan. 7. Bake for 25-30 minutes, for large muffins, in a 350 degree oven or until golden brown. My husband and I love to go camping. On our latest excursion, we visited a small campground where my husband has been camping since he was a small child. This campground is in a really small town where there is nothing to do but sit beside the lake and enjoy the nature surrounding you. However, there is a local dive where the chicken is as legendary and the colonel in Kentucky. This restaurant is really nothing more than a small shack on a back road. Honestly, if I had not been with my husband and his parents the first time I went there, I would not have gone in. There are paper menus on the wall, on-again-off-again air conditioning, and very limited hours of operation. Despite all these seemingly negative aspects, the line wraps around the building on Saturday nights. So why do people come to a place where the bread consists of a hamburger bun, the only option to order is chicken, and the drinks come in a jug to share with the table? Well, the answer is very simple. This local dive is an institution. They have been featured on several television shows, in national periodicals, and, despite the lack of interior decor, the chicken is one-of-a-kind. The first time I visited, we tried to determine how the chicken was cooked. Was it roasted and then fried? Smoked and then dipped? What was the secret? The meat was so tender, the exterior so crisp, yet it dripped with a spicy vinegar sauce. What was this? After several trips to this local gem, we finally figured it out. 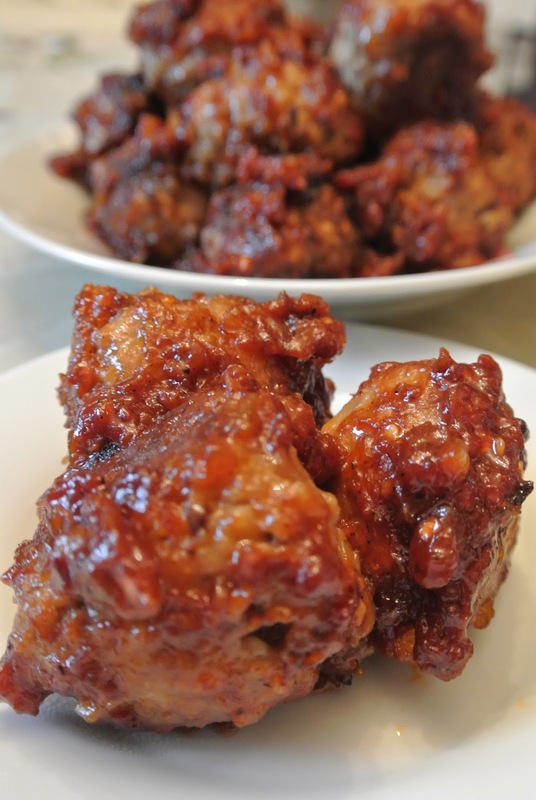 Due to a desire to have this delicacy at home, we developed this recipe for chicken wings. The light coating provides a crisp crust without the normal fried chicken batter. The sauce is tangy yet spicy and absorbs into the meat just perfectly. The double frying allows the meat to cook and the crust to become brown without burning. These might just be the perfect chicken wings. 1. Place the chicken wing pieces in a large zipper bag. Place the marinade ingredients in the bag. Use your hands to massage the marinade into the meat. Place the bag inside a large bowl. Allow to marinade for at least 2 hours or overnight. 2. Heat all of the ingredients for the sauce in a saucepan over Medium-High heat. Stir occasionally. Reduce heat to low and simmer for 30 minutes. Cover and remove from heat. 3. Twenty minutes before frying, remove the wings from the refrigerator. 4. While the wings are coming to temperature, heat a large deep fryer to 350 degrees. 5. In a shallow dish, combine the flour, corn starch, salt, peppers and garlic powder. Dredge each wing piece through the flour mixture, shaking off excess. 6. Cook the wings in 350 degree oil for 10 minutes. Remove from the oil. 7. Raise the temperature of the oil to 375 degrees. Return the wings to the fryer for an additional 5 minutes. 8. Use a pair of kitchen tongs to dip the fried wings in the warm sauce. 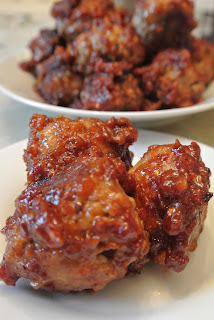 Allow each wing about 5 seconds in the sauce to absorb the flavor but not become soggy. 9. Store the remaining sauce in a jar with a tight fitting lid for use with pulled pork or chicken.